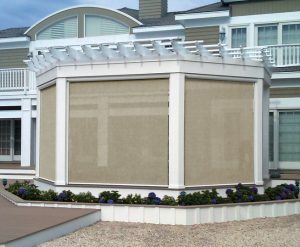 Carroll Architectural Shade proudly installs Sunesta screens, including Sentry and Sunroll, in the Baltimore and Washington, D.C. metro area, and throughout Maryland and Virginia. The Sentry is one of Sunesta’s exceptional screen products which gives you the ability to control your living space. No matter if you are covering your windows, doors, patio or lanai, The Sentry can be your solution. Each Sentry screen is custom built up to 18′ wide with a 12′ drop. The Sentry retractable screen combines ease of use with class in one quality retractable screen. 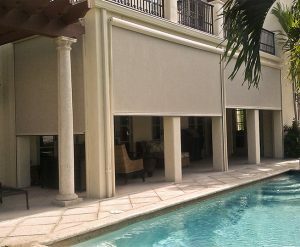 The Sentry screens serve as more than just a retractable screen, you can choose a custom fabric to meet the needs of your unique home and environment. And with its exclusive fabric retention system, you can rely on your Sentry retractable screen to operate in any weather conditions. The Sunroll Retractable Screen is one of our quality solar screens that will provide you with total vertical sun control of your covered outdoor space. Available in motorized or manual options, the Sunroll is an affordable and versatile option for individuals interested in purchasing one of our retractable solar screens. It can be customized to fit your unique space with widths up to 24′ and heights up to 12′.